KEXP is hosting a first-time-ever concert on the roof of Pike Place Market in Seattle on August 23rd. It features Mike McCready, and it's free. If you can get there, you'd be a fool to miss out. Music fans will soon be able to enjoy year-round, exclusive live performances both inside and outdoors at KEXP’s New Home at Seattle Center—but it’s still under construction. As a nod to the extraordinary shows to come, KEXP is hosting a one-of-a-kind FREE concert at another local attraction, Pike Place Market, on Sunday, August 23 at 7:00PM. 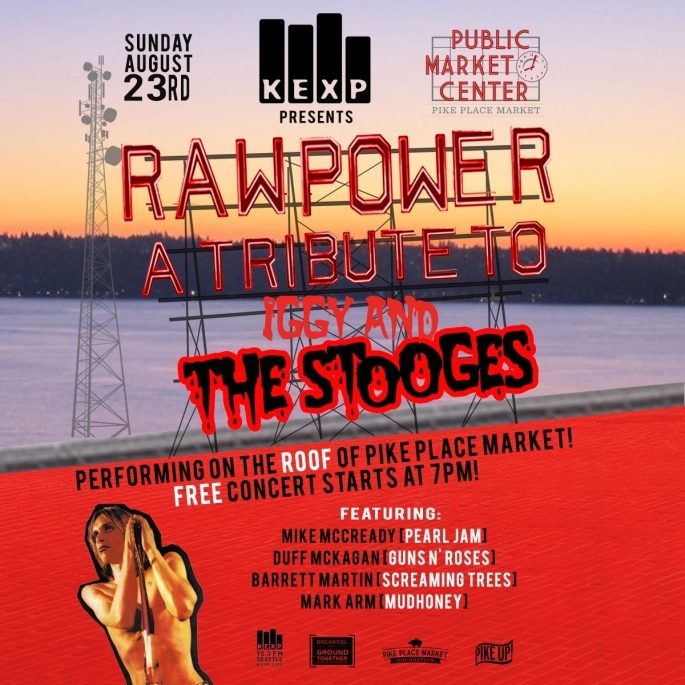 RAW POWER KEXP features four Seattle music legends—Mike McCready (Pearl Jam, Mad Season), Duff McKagan (Guns n’ Roses, Velvet Revolver), Barrett Martin (Screaming Trees, Tuatara), and Mark Arm (Mudhoney)—performing songs of punk pioneers The Stooges on the Market rooftop. This show marks the first time anyone has performed on the roof of Pike Place Market. RAW POWER will play directly underneath the iconic “Public Market Center” sign and clock where Pike Street and Pike Place meet. This concert is FREE and open to the public. Donate to KEXP's efforts to build a new headquarters, and you can win VIP tickets which include an intimate pre-show dinner and VIP after party with the RAW POWER musicians and a select group of KEXP Groundbreakers and DJs, up to $1,000 in travel expenses and a signed, limited-edition event poster.